In 5-quart Dutch oven, cook bacon over medium-high heat 10 to 12 minutes, stirring occasionally, until browned and crisp. With slotted spoon, remove bacon to small bowl. Season pork with 1/2 teaspoon of the salt and 1/4 teaspoon of the pepper. Add half of the pork to bacon drippings in Dutch oven, and cook 4 to 6 minutes, turning occasionally, until browned. With slotted spoon, remove pork from Dutch oven to slow cooker. Repeat with remaining pork. Add onions, carrots, remaining 1/4 teaspoon salt and 1/4 teaspoon pepper to Dutch oven; cook 3 to 4 minutes, stirring frequently, until softened. Stir in garlic and oregano; cook 30 seconds. Add broth; heat to simmering, stirring to remove brown bits on bottom. Transfer mixture to slow cooker with pork. Stir in tomatoes and bacon. Cover; cook on Low heat setting 8 to 10 hours or until pork is tender and easily falls apart. Before serving, shred pork with two forks. Serve over cooked pasta. Garnish with Parmesan cheese and chopped fresh herbs. 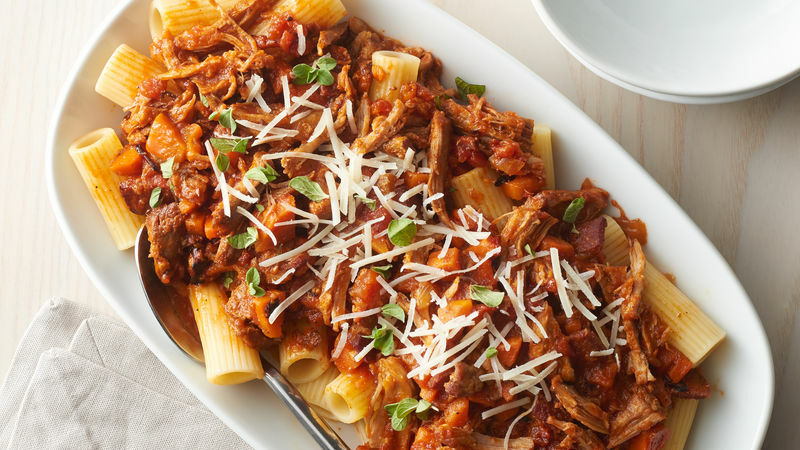 Pork Ragu can be made the day before! Be sure to cool uncovered 30 minutes before transferring pork to two microwavable storage containers. Cover and refrigerate. To reheat, microwave pork loosely covered on high 4 to 6 minutes, stirring every couple of minutes, or until thoroughly heated. Serve with a fresh green salad and a side of warm, crusty bread to complete this meal.